Celebrate the achievements of your school council! It’s easy to enter. Just tell us about the difference you made in your school or community. The size of your project doesn’t matter. It could be anything from increasing the number of recycling bins in your school to campaigning to save local wildlife. What matters is your school council’s efforts led to a positive change. Holy Cross School Council entered the competition based on the skills they had developed from Takeover Day. This was the response to their application. 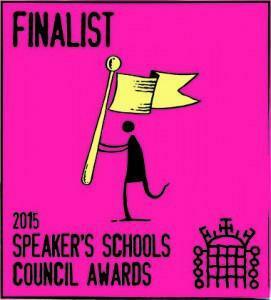 Thank you for submitting your project School Takeover Day to the Speaker’s School Council Awards 2015. I am delighted to inform you that the judges of this year’s Speaker’s School Council Awards selected your school council’s project to be a finalist– from hundreds of applications! We would like to congratulate your students on receiving this special recognition from the judges. To celebrate your students’ achievement please see attached a digital badge in the email that will follow, which you can show off on your school website. Your school council will also receive a certificate in the post. On behalf of the Speaker of the House of Commons, the Rt. Hon John Bercow and the Speaker’s School Council Awards team we would really like to thank you and your school council for participating in the competition and taking the time to tell us about all the hard work that has gone into making your project great. We wish you every success with your future projects and look forward to hearing about them in next year’s competition! Don’t forget to keep checking our website- www.speakersschoolcouncil.org for regular updates, tips and resources for next year’s entry. Also, if your school council would like to write a piece for the blog about their project, please do get in touch.